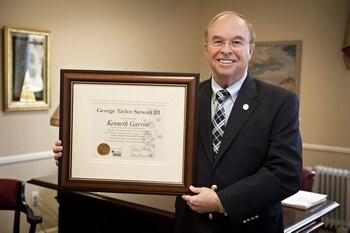 President Kenneth Garren recently received the George Taylor Stewart III Award from the Lynchburg Regional Chamber of Commerce for exemplary service to the Lynchburg region. Rex Hammond, president of the Chamber, noted that Dr. Garren has led the College through eleven years of unprecedented growth with record enrollments at both the undergraduate and graduate levels since his tenure began in 2001. Dr. Garren serves on the Boards of the Commission on Colleges, Southern Association of Colleges & Schools; the Virginia Foundation of Independent Colleges and Co-Chairs the annual Ethics Bowl tournament among the 14 member institutions; as well as the Executive Committee of the Council of Colleges & Universities of the Christian Church. He also serves on the Lynchburg City Schools’ Education Foundation, the Lynchburg City Schools’ Partners in Education, Lynchburg Regional Chamber of Commerce Board, Executive Committee, and Legislative Affairs Committee, and is the current president of the Sphex Club in Lynchburg. In addition to his board service, he has continued development at LC’s Claytor Nature Study Center with construction of the Belk Observatory and has led restoration efforts for College Lake. He has also been recognized locally by the Piedmont Chapter of the Military Order of World Wars with the award of the Silver Patrick Henry Medallion for Patriotic Achievement. He received the 2010 Humanitarian Award by the Virginia Center for Inclusive Communities. George Taylor Stewart, who died in 1999, was a business leader who gave much of his time, talents, and resources to Lynchburg and the region. Stewart was the chair of the LC Board of Trustees for nearly 10 years (1980-89). In 1963, he joined First Colony Life Insurance Company in Lynchburg as a director and was its chairman and chief executive officer from 1965 until his retirement in 1992.